FACT, FICTION, AND FLYING SAUCERS by Stanton T. Friedman and Kathleen Marden is a new audiobook narrated by a slow talking Chris Sorensen. 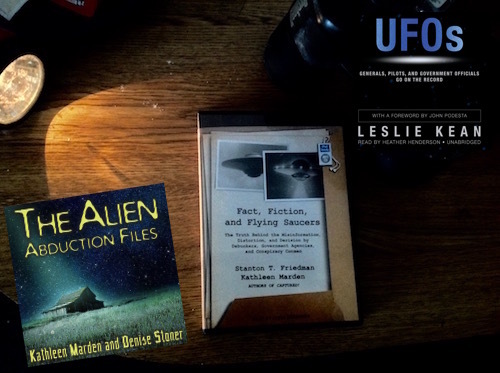 (Others that are available on the subject are UFOs by Leslie Kean and The Alien Abduction Files by Kathleen Marden and Denise Stoner.) Regarding the new book, it is mainly an attempt to debunk the debunkers: those critical of the UFO reports on record suggesting that alien craft are visiting Earth from other star systems. While some valid points are made by the authors, (including that there has been a systematic denigration of Ufologists by the media and other scientists,) I do have problems with the flaws in logic employed in flipping the argument. For example, they attribute bias to most of those skeptics who interpret the evidence differently, (these skeptics discounting the eyewitness accounts of professionals.) Chapters are spent recounting the backgrounds of witnesses…their degrees, their accreditations, awards, even that they are highly respected by their communities or have served in the military or law enforcement. This amounts to an appeal to authority, one of the fallacies outlined in “The Beginning of Infinity,” an audiobook which shows how science actually works. The problem is that real science doesn’t care WHO says something, only if it can be proven or repeated. There is no doubt that many of these respectable people saw something, but any accident investigator will tell you that eyewitnesses often give contradictory accounts. Extraordinary claims require extraordinary evidence, and there is still no absolute physical evidence for UFOs in museums. Even the Roswell museum, (which I have visited, and where the author claims a real UFO crash happened) is unclear about what happened, and presents both sides. To posit that NASA and the Air Force are hiding UFOs is conjecture and supposition, based on redacted documents and questionable testimony. If you go the conspiracy route, you may end up with believing that the moon landing was faked, and that the Earth is flat (as many on Youtube try to “prove” as a means of diverting attention from simply claiming global warming is a hoax.) It is pseudo-science. One can say one doesn't believe anything the government says, but that is illogical too. The choice is not all or nothing. Life is not black and white except to racists. Science is not a ball game with opposite end zones. I do believe we are not alone in the universe, but to say that Ancient Aliens built the pyramids is just nonsense. Dr. Michio Kaku, which the authors denigrate in the book, has said that in order for aliens to be here on Earth they would need to be over a million times as energy efficient as us, and would probably not send biological beings but rather robots (if they themselves are not now machine intelligence, as in 2001: A Space Odyssey.) “They wouldn’t land on the White House lawn because we would be ants to them, anyway.” The authors, rather than discuss the physics of what Kaku says in his new book Parallel Worlds (which mentions human signals only reaching a tiny portion of space so far, plus the odds against travel at near light speed) suggests that the UFOs haven’t visited the White House due to detection by radar and weapons in the no-fly zone. If a civilization is a million times more advanced, what possible threat could military jets pose to them? Have the authors been watching comic book movies? Furthermore, could a craft from another star system endure the rigors of deep space, skirting light years of violence and radiation, only to crash in the New Mexico desert? And what about the wide varieties of craft purportedly seen and defended by the authors? Some make no sound at all, others shoot flames that light up the countryside. Yet they are both included in the 5% of “valid” UFO sightings, outside the 95% explained as weather, other craft, or hoaxes. Would alien technology used to reach Earth really spew fire? What kind of fuel would that be: regular or diesel? Finally, the authors have a few Freudian slips, as when they refer to the “UFO Movement,” which implies a dogma or religion. One 18 year old witness is described twice as a “man.” He can’t drink alcohol in many states, and he’s a man, not a teenager? Here I am just using their own logic. Yes, data gathering should continue. But you can’t cherry-pick your “evidence” and call it science. Especially since most of their evidence is from the 50s and 60s, back when there were no cell phones. (In a new book, why not limit the evidence to new sightings? Are there no iPhone videos and high def photos to illustrate? Have the UFOs returned to some star system SETI has yet to hear from? If so, why should we care about UFOs anymore?) A quote from physicist Neil deGrasse Tyson: "Science doesn't care what you believe. It’s what you can prove.” Let them show those redacted documents…the print below the blacked out lines. If they are NOT about keeping Air Force experimental aircraft technology secret (but rather about UFO technology) I’ll eat my hat, and they will win the Nobel Prize.